Increased competition was consistently rated as the second most-challenging issue faced. In the current climate, companies are competing for skilled workers as well as for profitable jobs. The survey also asked about challenging issues facing different levels of managers in the construction industry. This year, the most challenging issue for field managers, project managers, and senior managers was leading and motivating. Managers in this industry, as in all others, are constantly striving to find the best way to get the most out of their most-important resource-their people. For field managers, the second highest rated challenge was a very practical one-planning and scheduling. Project managers’ second most-challenging issue was communicating effectively. Communication showed up as a significant challenge among all levels of management. Curiously, only 17 percent of companies plan to offer training to address their managers’ number-one challenge of leading and motivating; only 15 percent plan to offer communication training; and only 15 percent plan to offer training related to planning and scheduling. It comes as no surprise that respondents indicated that the one factor having the most significant impact on field productivity is the declining skill of craft labor. This drain on productivity was followed very closely by poor job planning. Both of these responses reflect the same industry-wide challenges voiced in other areas of the survey. 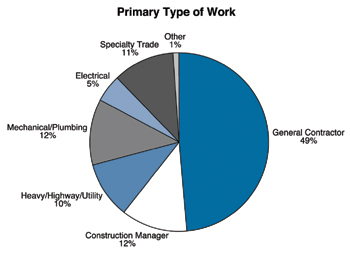 Nearly half of the respondents (49 percent) represented general contracting firms, and 12 percent were construction management companies. Seventy-one percent of respondents represented companies with $100 million or more in annual revenue, and 12 percent reported 2,000 or more employees. Only 37 percent of companies employed less than 500 people at season’s peak. 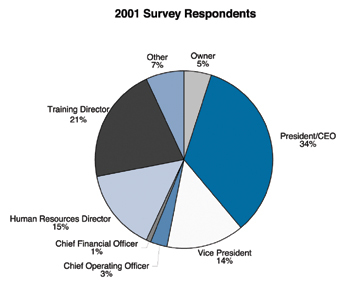 Owners, chief executive officers, presidents or vice presidents completed the majority (53 percent) of surveys. This statistic continues to be very encouraging, highlighting the high level commitment to training issues among leaders in the construction industry. Such commitment is the cornerstone of successful training and development efforts. In many other industries, there has been a shift toward delivering training through electronic means instead of traditional, in-person training. Construction, however, remains a very hands-on and traditional industry. Nearly three-quarters of the respondents to the 2001 survey rely mostly on instructor-led, classroom-based training as the mainstay of their efforts. Only 11 percent use technology to allow training to be delivered by an instructor from a remote location, an even fewer (7 percent) use computer-based training that doesn’t require a human instructor. Of those companies that do use computer-based training methods, 47 percent offer training online through an internal network. About one-third use CD-ROM or Internet-based training, and only 8 percent offer training on computer diskettes. Survey respondents were asked about the obstacles that inhibit their use of computer-based training methods. The most frequently cited factor was that companies aren’t convinced these methods work as well as classroom training. Technology does appear to be gaining ground, however, in how companies are tracking and monitoring their training efforts. Nearly two-thirds of the firms responding to the survey use some form of computer record-keeping for their training. Only 23 percent indicated that they still keep records by hand, and fewer still (12 percent) reported that they don’t keep records on training. Another encouraging trend relates to how training is managed within construction companies. More companies indicated that training is a full-time responsibility for one or more people, while fewer responded that training is managed as time permits from other responsibilities. Fewer still said that they have no formal education or training function in their company. In the 1992 survey, nearly 30 percent of companies had no formal training function; in 2001 that number dropped to just 6 percent. It appears that many companies plan to increase their spending on training in the next year-46 percent of respondents plan to increase spending for technical and craft training; 65 percent plan to spend more on management training; and 53 percent plan to devote additional resources to safety training. Hardly anyone responding to the survey indicated that they plan to spend less on training in any area. While expenditures are on the rise, one troubling relationship persists from previous year’s surveys. Construction companies spend less than half on training trade/craft personnel than they do for senior executives, project managers or field managers. This discrepancy is despite the fact that companies consistently report that the greatest challenge they face is the lack of skilled craft workers. Trade and craft workers also receive less training than the other groups in terms of hours of training. About one-quarter of the companies that responded to the survey are operating a corporate university and have been for an average of three years. Another 31 percent are either in the process of establishing a corporate university, while one-third have no plans to start one. Twelve percent of respondents were unfamiliar with the concept of a corporate university. As might be expected in an often dangerous industry, safety is the training topic often provided by the companies responding to the survey. Almost all respondents (95 percent) indicated they provide safety training. They also frequently offer training in computer applications, management skills, and technical/construction-specific skills. Training addressing the changing face of the construction workforce (diversity, English as a second language, etc.) is much less common in the industry, even though 28 percent of survey participants indicated that inability to speak English is a challenging issue in their company. Reprinted with permission from the FMI Management Letter, FMI Corp. (919-787-8400).